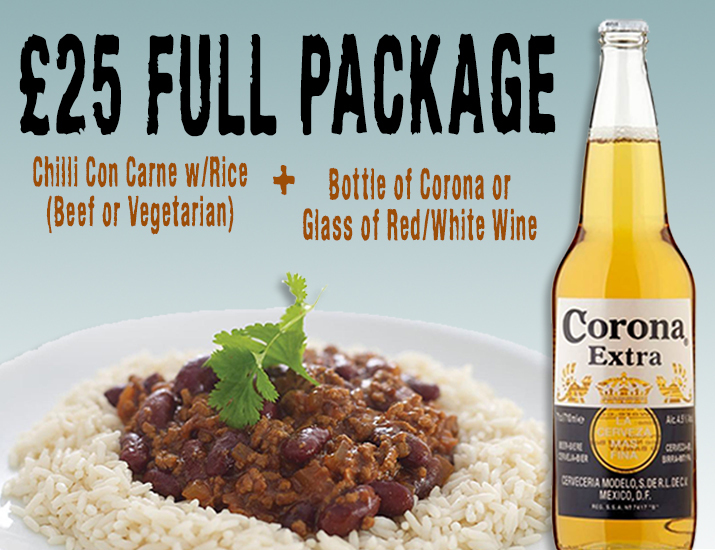 Your comedy ticket, plus delicious home-made Chilli Con Carne with fluffy boiled rice, plus a beautifully chilled bottle of Corona, or a glass of red or white wine, for the all-in price of just £25. So, forget about having to eat before you come out, and get your first drink included in the price of your ticket. Well, you just book a £25 Full Package ticket on this very site, and leave the rest to us. When you arrive, we'll give you a meal and drinks voucher. You simply hand these over at the food servery and bar. We will have table seats allocated to you before you arrive, for all members of your party, so there's no need to worry about being first through the door for first-come first-served.